You are currently viewing archive for February 2009. Account to a source that spoke to ESPN, Alex Rodriguez is set to meet with MLB officials on Sunday. Update 2: The account is real! Update: The Twitter account is linked on Sabathia's official site. Updating a previous story, Mark Newman of MLBlogs reports that he confirmed with CC Sabathia's marketing person that the CC_Sabathia account is a fake. Sorry for the confusion. The reason that we had passed it along originally was because Nick Swisher's account had been verified and Swisher was following the Sabathia account (and only 3 others). So, apparently, Nick (or whoever set up Nick's account) thought it was him, too. Oh well, no biggie - maybe CC will sign up eventually. On a related note, Andrew mentioned that Yankees prospect Bradley Suttle now has a blog. Graham Goldbeck at Beyond the Boxscore takes an in depth look at Mariano Rivera's 2008 season and how his cutter was the epitome of everything that is good in the world. Peter Abraham and Tyler Kepner have pictures of the Yankees hat for this season - there is an "Inaugural Season" patch on the back of it. 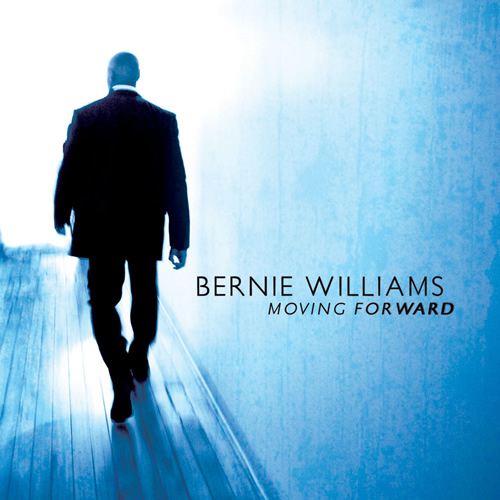 02/26: Album Cover, Details and Audio from Bernie Williams' Sophomore Effort, "Moving Forward"
For those interested, I thought I'd pass on some details on Bernie Williams second album, "Moving Forward." The cover is above and there is some additional information, from the label, below. Also, listen to "Take Me Out To The Ballgame" (featuring Bob Sheppard on the intro) and "Glory Days." The album will be released on April 14 off Reform Records/Rock Ridge Music. You can pre-order at Amazon.com. Alex Rodriguez was told by the New York Yankees to keep his cousin away from the team. The message was given to the star third baseman on Thursday, said a person familiar with the situation, speaking on condition of anonymity because the team did not make an announcement. The message applied both to spring training and the regular season, the person said. Rodriguez also was told the cousin should not be anywhere the team congregates, which presumably includes the team's hotel when it travels and the ballpark. Speaking at Steinbrenner Field in Tampa, Fla., general manager Brian Cashman said only that the matter of Rodriguez being picked up from his spring training opener Wednesday by his cousin "has been handled." Rodriguez took a similar tone following New York's 5-1 victory on Thursday over Tampa Bay. "It's been addressed," he said. "And, no further comment." This comes a day after his cousin, Yuri Sucart, was seen both arriving at and leaving the Blue Jays' spring training ballpark in Dunedin, Florida, where the Yanks were in town for an afternoon game. A lot of people in the media have gone way over their heads here to assume that A-Rod should somehow disown his cousin over this whole steroid thing, but the Yankees are right in asking Rodriguez to simply keep him away from the ballpark to avoid the distractions. MLB.com's Bryan Hoch and Hal Bodley, as well as Peter Abraham all have quotes from Mr. October on A-Rod's tumultuous offseason and what the third baseman needs to do now. In so many words: hit. Rodriguez's parting words to Jackson at the end of the '08 season, before all of the steroids talk began, was that he would be gunning for him in April. With 553 to his name, Rodriguez needs just 10 to tie Jackson. "He'll blow by me like I'm standing still," Jackson said, with a grin. "It's a shame -- one of the all-time greats." His gallows humor masks some disappointment. Jackson considers Rodriguez a friend, but he also refers to him as a Yankees "asset" -- a sharp word general manager Brian Cashman used after Rodriguez's news conference, coldly portraying him as a corporate investment. "'You deliver this message,' [Steinbrenner] said sternly to me. 'You tell him to hit the damn ball and hit it when it counts,'" Jackson said. "Yes, that's really the most important thing Alex can do at this stage. All the other conversations, they don't matter. The more you talk, the more you have an opportunity to make a mistake or say something stupid or something you can go trace. "My dad used to say you can control the story as long as you still get a chance to hit. Take the bat away and you start running your mouth, you're going to get in trouble. Edit your own story with the bat, and as long as Alex does that, he's got a chance to change things." On the road to promote "Baseball Prospectus 2009," five of the Baseball Prospectus group will be appearing at the Yogi Berra Museum & Learning Center on Sunday, March 1 at 2 PM. They'll be doing a Q&A panel as well as a book signing. Among them, Cliff Corcoran of Bronx Banter and Steven Goldman of Pinstriped Bible. For more info, see the museum's website. Jose Veras says he was unaware he was named to the Dominican Republic's WBC roster until a Dominican team official informed him Tuesday morning. Veras had previously said he would not participate in the tournament. "It's an important season for me," Veras said. "I don't have a regular spot here, and I have to fight for my spot. I don't think that, if I go 20 days [away from] my team, it's going to be possible." Veras, 28, was a regular presence with the 2008 Yankees, appearing in a career-high 60 games and going 5-3 with a 3.59 ERA, walking 29 and striking out 63 in 57 2/3 innings. Yankees manager Joe Girardi has listed Veras among those in competition for a middle-relief or setup role in camp. "I just want to be here working for my spot and do my best to give the team a chance to win the game," Veras said. "All my concentration right now is here, not on the Classic. I promise you they'll find somebody else." The problem is, I'm not sure if they are allowed to find somebody else. The rosters submitted on Tuesday were supposed to be final. So it looks like the Dominican team will have to go with 27 guys (WBC rosters can carry 28 players). It's probably not a huge deal but I've been under the assumption that Veras would have a spot on the Yankees' roster anyway. Spring training games finally started across the league today, and the Yankees won their first game in Dunedin against the Blue Jays by a score of 6-1, thanks in part to a 4th inning homer by Alex Rodriguez. Rodriguez, who walked his first time up, homered in his first official at-bat of the game. Brett Gardner belted one out as well. Brett Tomko started the game and pitched two scoreless innings. Jose Veras, who allowed the only run in the game, received the win for what it's worth. Previously, both Ramirez and Veras had pulled out of the Classic. Damaso Marte confirmed to Hoch that he would be playing, so that means that 8 Yankees will participate. MLB.com's Bryan Hoch reports that Edwar Ramirez has been diagnosed with mild bursitis and will be given a few days off - at least 3. "He's going to be down for a few days," Yankees manager Joe Girardi said. "The hope is to get him back on the mound shortly. We're not considering it to be a long time, and flat ground would be the first thing that he would do. We're hoping to maybe do that this week." Baseball America's top 100 prospects list for 2009 has been posted on their website. Yankees occupy three slots on the list. Austin Jackson is the top player at 36, but Jesus Montero is a close second at 38. Finally, Andrew Brackman comes in at 92. ESPN reports that Alex Rodriguez will be meeting with MLB investigators about his admitted steroid use sometime this week. The article, citing Newsday, states that the league wants to talk to Rodriguez sometime between Wednesday and Friday. A-Rod and the Yanks will get in their first game action tomorrow, opening up their Spring Training schedule in Dunedin, Florida against the Blue Jays at 1 p.m. ET. On Monday, after polling some veterans last week, Joe Girardi decided to give the team a day off and take everyone to a pool hall to play a 2 on 2 tournament. Bryan Hoch, Peter Abraham (pictures), Abraham, Roderick Boone, Tyler Kepner and Marc Carig have reports. So, who won? None other than Mariano Rivera. "It looked like he was pretty good," Johnny Damon said, according to Carig. "He definitely had that closer mentality, even playing pool." Phil Coke is being groomed as a reliever, Joe Girardi told Peter Abraham. They are looking to develop him into someone who can work long relief. For his part, Coke's ready to take whatever role he can get. "I started a lot in the minors but I liked pitching in relief last year," he said, according to Abraham. "Whatever they want." Peter Abraham reports that Jorge Posada will be honored on March 20 at the Ted Williams Museum dinner at Tropicana Field. He'll be given the community service award for his work through The Jorge Posada Foundation. Well deserved! The AP reports on A-Rod retaining Jay Reisinger, a lawyer who worked with Sammy Sosa and Andy Pettitte. Previously, Rodriguez had hired James E. Sharp, another member of the legal teams that represented both players. 02/23: Mark Melancon Dresses to "Impress"
Both Peter Abraham and Tyler Kepner wrote about the 30 pitches that Yankees pitcher Mark Melancon threw on Sunday and both used derivatives of the word impress in their headlines. "Mark Melancon impresses the Yankees," writes Kepner. "Melancon impressive," writes Abraham. Safe to say that the 24 year old had a good day. Joe Girardi told Kepner that Melancon has a legitimate chance to make the bullpen out of spring training. Peter Abraham reports on some adjustments that Joe Girardi is making in his approach in dealing with players and the press. I think it's a good thing. We'll see what adjustments hold out in the long term. Christian Red and Ian Begley of the Daily News have dug deeper into the Angel Presinal story, speaking to a former scout who alleges that Presinal was an expert at helping players beat steroid tests. According to a former baseball scout, who worked with players who trained with Presinal in the Dominican, Presinal provided some players with steroids. The former scout declined to be named in this story but says that players refer to Presinal as “The Cleaner,” someone who can rid traces of steroids from the players' urine before a drug test. “He puts them through a cycle and then they flush the body out,” the former scout said. “If you're afraid of testing positive, this is the guy to go to.” He said players are afraid to discuss Presinal because they depend on his expertise as a trainer. It is also expensive to work with Presinal, according to the former scout, who says the trainer charges as much as $10,000 for an offseason session. Baseball Prospectus' Kevin Goldstein has named his top 100 Yankees prospects. Jesus Montero comes out on top, with Austin Jackson second. See the whole list for more. Our next interview is with Mike Ashmore who covers the Trenton Thunder, the Yankees Double-A affiliate, at Thunder Thoughts, for the Hunterdon County Democrat. When you aren't doing something related to or depending on the Yankees or the Thunder, what are you up to? I'm currently in my first season of covering the Trenton Devils for the Democrat, but the coverage is online only. I'm basically using the same layout as I am for the Thunder coverage, as that proved to be pretty successful. When I'm not working, I'm usually just taking in a hockey game for fun or hanging out with friends and so on. During baseball season, when I'm not covering the Thunder, I'm covering the Somerset Patriots of the independent Atlantic League. So I'm always busy doing something. How long have you been blogging about the Yankees or the Thunder? This will be my fourth season as the Trenton Thunder beat writer for the paper, but I've only been doing the blog since January of 2008. Best... one of the fundamental principles of journalism isn't to necessarily have it first, but to have it right. But when you know you're right, it's always best to have it first. So with the blog, I can reach literally thousands more people than I could just with my print coverage, and can provide them with the information they want before they could find it in the next day's paper. The best part, for me, of doing this particular blog is that I have total control of the content on there... basically, my paper has nothing to do with it. So I can do the blog the way I think the blog should be done, so I try to think of what I like to see when I'm reading other beat writers' blogs, which I do all the time. I want up-to-the-minute information, I want photos, I want video, I want audio, I want quotes, I want to feel like the writer is accessible to me... and those are all things I feel like I've been able to accomplish with the blog. Worst... I wouldn't say this is necessarily a bad thing, but it makes you work super hard because you're expected to know everything about the team, inside and out. Ideally, for what I post on that blog, I would have someone else alongside me doing it. And I've had several people offer to help me with that. But while my paper has nothing to do with the blog, the credential that the team provides is through my paper... so that's not a situation that would be possible. There just isn't really time to relax during a game, which gets a little frustrating at times. Looks like Bernie got a few good swings in the other day. Final WBC rosters are announced on Tuesday. I hope he makes it. Steve Serby has an interesting and entertaining Q&A with CC Sabathia. Q: Why do you wear your hat cocked? Q: Your son Carsten Charles III is a huge baseball fan? A: He kept saying, "When are you playing for the Yankees?" He wanted me to play for the Yankees so bad. A: He plays Power Pros on Wii. The Yankees are his favorite team on that game. A: Derek Jeter, of course. Kat O'Brien spoke with Robinson Cano, who had admitted to working with Angel Presinal during the 2007-2008 offseason. He also says that he'd work with him again. Cano said he didn't worry about the risk of being tainted as "guilty by association" because he knows he hasn't done anything wrong. He would not comment on whether Rodriguez is associated with Presinal but confirmed that he had seen Presinal around the team in the past couple of seasons -- not in any official capacity but in places such as the team hotel, at the gym or in restaurants in cities in which the Yankees were playing. Wallace Matthews spoke with an unnamed Yankee official and Joe Girardi, on the subject of Presinal. A Yankees official told me the club would love to prohibit its players from working with Presinal but fears that doing so would open it up to a defamation or loss-of-earnings lawsuit. "You always worry about the character of the people around your players, always," Girardi said. "But I'm not sure how much power I really have in that area." The New York Post is reporting that pitcher Jason Johnson has been diagnosed with cancer of the retina. Our thoughts are with him and those close. Hopefully the treatment does it's job and he has a speedy recovery! Felix M. Lopez III, the son of George Steinbrenner's son-in-law Felix M. Lopez Jr., was charged with trafficking illegal steroids in 2002, a first-degree felony that was punishable by up to life in prison. Lopez III, 30, cut a plea deal in which he received three years of probation for pleading guilty to possession with intent, which is a second-degree felony, according to Hillsborough County Court records. In an interview with Newsday on Friday, the Yankees senior vice president said he stands by his son. But he said his son will never work for the Yankees because of his past and the negative perception it would create. 02/21: Jason Jones Displeased About Time with Yankees; "You Just Don't Feel Like a Part of the Team"
Former Yankee Jason Jones, drafted by the Twins in the Rule 5 draft, talked with the Pioneer Press and wasn't terribly pleased with how he was treated during his time with the Yankees organization. Trouble is, as much as he welcomed the thought of being a Yankee, they never seemed particularly interested in welcoming him. He shared a spring training locker room with guys who worked for the same organization, but he had a difficult time thinking of them as teammates. "That's how I would describe it — you just don't feel like a part of the team. There are the veterans — the superstars — and then the rest of the guys," said Jones, who was drafted by New York in the fourth round in 2004. "Here, there are superstars too, but it feels a lot more like we're a team. It's a lot better chemistry." He also described how Brian Cashman barely said a word to him. Honestly, Jones was one of hundreds of players in the Yankees system. I don't know how surprising that really is. This isn't all that bad, but it does make for funny circumstances, should Jones come back to the Yankees. With the Rule 5 draft, a player must stay on the selecting team's 25 man roster for the entire season or he is offered back to his former team. Chad Jennings has an interesting take on this. Update 3: The account is real! Update 2: Or is it? Update: The CC Sabathia account is a fake. New Yankees Nick Swisher and CC Sabathia are on Twitter. Imagine if A-Rod was on there answering questions. Today, the Daily News reports that, according to "independent sources" (pretty hazy really), A-Rod was accompanied by Angel Presinal for the entire 2007 season, staying in different rooms in the same hotels as the third baseman did. Peter Abraham points out in February of 2007, ESPN reported on the trainer, who said then that he had worked with A-Rod. What the Daily News adds to this story is that even after the ESPN story came out in February 2007, A-Rod maintained ties with Presinal. Why?! This is a guy who was caught with a bag of steroids at an airport in 2001 and subsequently banned from all MLB clubhouses. I don't understand it. ESPN Radio reports (via Ben) that he could be suspended. Peter Abraham reports that relief pitchers Edwar Ramirez and Jose Veras have both opted out of the World Baseball Classic. They're joined by Melky Cabrera. Chad Jennings has a rundown of some other potential WBC participants and where he thinks they'll end up. ESPN's Buster Olney reports that the Yankees and Padres are bidding on Walter Silva, a Mexican league pitcher. Baseball Reference has more on him. The AP reports that George Steinbrenner and Bernie Williams are at Yankees camp today. The owner is meeting with players and prepping for the World Baseball Classic. Joe Girardi has revealed the 2-6 order that he's "leaning" towards. With Jeter perched at the 2 spot, Mark Teixeira would hit third, A-Rod would hit cleanup and then Hideki Matsui and Jorge Posada would be the fifth and sixth hitters, respectively. It's not 100% set in stone, as it will depend on health and performance in spring training, but that is where he has them stacked up right now. Anthony DiComo of MLB.com spoke with Hideki Matsui about his full time DH role. MLB.com's Ian Browne reports on the Boston Red Sox ownership coming out in support of a salary cap or "salary zone." Hank Steinbrenner has responded, basically saying that the Yankees pay a large amount of luxury tax and revenue sharing money and that, as long as they do that, they should be allowed to spend what they want. He's right, of course. The Yankees are playing within the rules of the game. But, the Red Sox, and some others I'm sure, want to change those rules. YanksBlog.com reader Carlos left a comment yesterday, asking about reports that Jorge Posada had left midway through Alex Rodriguez's press conference on Tuesday. As Seamus noted in the comments, Posada left due to family reasons, reports Peter Abraham. Kat O'Brien adds that his family was flying back to New York. Last week, Jim Leyritz was jailed on charges of operating a motor vehicle while under the influence of alcohol, in violations of his bail. cbs4.com reports that Leyritz is now free, after the judge who signed the arrest order was found to not have the jurisdiction to do so. Prosecutors claim Leyritz tried to drive his car with alcohol in his system on at least four occasions. [Leyritz's attorney David] Bogenschutz doesn't dispute the allegations but claims his client ''misunderstood'' his restrictions. Really? Would he really drink and drive given his current legal woes? Wow. The "Where's Waldo?" portion of the A-Rod steroid saga may have come to an end as an ESPN report states that the cousin A-Rod mentioned in Monday's press conference has been tracked down and identified as one Yuri Sucart (via Newsday). Sucart's wife is apparently the source and told ESPN that "her husband had nothing to say." Carmen Sucart told ESPN that her husband would have "nothing to say" because what A-Rod said in the news conference "is what happened and that is all." Sources in the report describe a long relationship between Sucart and Rodriguez, dating back to Rodriguez's days in Seattle. The sources corroborate Rodriguez's account of their drug use in the past, saying Sucart was a "mule, not a guy who would initiate anything." MLB.com has video of Derek Jeter's press conference earlier today. Jeter repeated his support of A-Rod, but also went on to say that not everyone took steroids and that this should not be looked at as a "steroids era." MLB.com's Bryan Hoch reports that Derek Jeter will be holding a news conference today at 1 PM ET to discuss A-Rod's admission of steroid use as well as yesterday's press conference. Previously, Jeter said he would wait to address it until A-Rod had done so and until all of the media outlets had reached Florida, in order to limit the need to repeat himself. True to his word, the Captain will address it the day following A-Rod's press conference. MLB.com will have it live and I'm sure it'll be on the major sports networks, as well. MLB.com has the full video from A-Rod's press conference yesterday, as well as a full transcript. For more, check out Seamus' liveblog. Brian Cashman was clear in his feelings, after wards. "Those are the facts he gave you," Cashman told Peter Abraham when asked about A-Rod's "young and stupid" explanation. "It doesn’t mean it's acceptable. I like the fact more that he was stupid rather than young or naive. It was a bad decision that may cost him on so many levels." "We’ve invested in him as an asset. And because of that, this is an asset that is going through a crisis. So we'll do everything we can to protect that asset and support that asset and try to salvage that asset." I'm on the same wavelength as Cash here. A-Rod has a lot of work to do. The video below features a part of this quote, plus some reaction from Johnny Damon (who is simply glad that A-Rod didn't murder anyone - kidding!) and Joe Girardi. There might be obstacles to getting good value in return for Giles. For one, Giles' consent is needed for a trade to any of the other 29 clubs. A trade also would raise Giles' salary to $11 million, via an assignment bonus, lowering the player's value. When asked Tuesday if he had any potential trade destinations in mind, Giles mentioned the Red Sox, Yankees and Angels. He said the Angels would have a “huge” geographic advantage because he would like to stay near his daughters, but he also questioned whether any of those clubs would have a starting job for him. The Angels, for one, have a glut of outfielders. Thanks to Patrick for the link. I'm not too sure we're going to be hearing anything we haven't heard already, but I am going to liveblog the press conference that A-Rod will be holding at 1:30 p.m. ET, which is about three minutes from now. My guess is that this is going to be pretty much a repeat of the Peter Gammons interview plus a few familiar faces in the background, but we'll see. Update: For more details, check out Seamus' liveblog. A-Rod's press conference will be held today at 1:30 PM ET. In addition to Jorge Posada, Andy Pettitte, Mariano Rivera and Derek Jeter, CC Sabathia, Mark Teixeira, A.J. Burnett, Joe Girardi and some of the coaches will also be attending. MLB.com will have live coverage starting at 1 PM. It's unclear if it'll be video or audio, as they just have radio page right now. So, it may just be audio. Edit: It'll be on ESPNEWS and YES, as well, as Seamus noted. In interview with WFAN (listen below), Bob Sheppard said that he is hoping to make his return on April 16, when the Yankees open up the new stadium. Via Mike via Artist formerly known as 'The' Steve. 02/16: Brian Bruney Appeared in "Kindergarten Cop"
Tyler Kepner has a fun fact: Brian Bruney, as an eight year old, appeared in the movie "Kindergarten Cop," which starred Arnold Schwarzenegger. MLB.com's Tom Singer reports that A-Rod called SI.com's Selena Roberts to apologize for the accusations he made about her methods. She's withholding further comment until A-Rod holds his press conference. Pitcher Alfredo Aceves has decided to skip the World Baseball Classic, according to MLB.com's Bryan Hoch. "This is my job," Aceves told Hoch. "I cannot leave my job. I have to have a job first. I want to make my team and help the team." While he had a desire to the Mexican team, Aceves is also fighting for a Major League spot and has decided to make that his focus. MLB.com's Bryan Hoch reports on Chien-Ming Wang's road back to the rotation. It's understandable that with the additions of CC and A.J., that they are getting a lot of attention right now, but Wang is a top shelf guy and part of what makes this rotation so strong - the depth. A rotation of Sabathia, Burnett, Pettitte, Someone and Joba is a very good rotation, but is not the top of the league rotation that a Sabathia, Burnett, Wang, Pettitte and Joba lineup would be considered. It's exciting. Anthony DiComo of MLB.com reports that Alex Rodriguez is planning to hold his press conference on Tuesday, to further address his admission of steroid use, possibly in a similar manner to Andy Pettitte last year. Brian Cashman told Peter Abraham that, during spring training in 1996, George Steinbrenner was interested in acquiring a shortstop. The team was unsure that Derek Jeter would be ready to start. Felix Fermin of the Mariners was discussed, and Seattle wanted either Mariano Rivera or Bob Wickman in return. "It was a big fight and we were very close to doing it," Cashman told Abraham. "Thank God we didn't." Fermin ended up being released on April 13 and signed with the Yankees on May 8. But, they released him, too, on May 22. He caught on with the Cubs on May 29, hit .125 in 16 at bats, and was released on August 9. He did not see Major League action again. Ken Davidoff shares some George Steinbrenner stories, as told by Jorge Posada, Yankees adviser Ray Negron and Goose Gossage. "I miss Steinbrenner. I miss him walking around," Posada said. "I miss being able to talk to him about baseball, football. Anything. "It was tough love. You knew that coming in. But you know what? He cared about everybody in here ... You heard little stories about how he'd have them remove the whole carpet [in the clubhouse] because there was a little stain in the middle. Little things like that. He did anything to make us comfortable. He was good at it." Added Posada, whose son Jorge has overcome craniosynostosis: "He was always the first one to ask me every day, how's my son doing?" Newsday's Kat O'Brien spoke with Mo and he says that he'll be ready for spring training action. He also talked about his outlook for the future and his optimism for this years squad. Andy Pettitte, on contract negotiations with the Yankees: "The running joke with some of my friends was that I was going to pay the Yankees to come back." David Robertson, on the possibility of him and his brother, Mets pitcher Connor, sharing an apartment in New York if they both make their respective teams: "Two hillbillies in Manhattan." CC Sabathia, on his agent's reaction to the pitcher going short rest for the Brewers last season: "I had to shut my phone off and block his calls. He was pretty upset about it. He was freaking out." A.J. Burnett, on Andy Pettitte and Joba Chamberlain forming the "backend" of the rotation: "I'm not sure there is a back end." Andy Pettitte, Jorge Posada, Mariano Rivera and Derek Jeter are planning to attend A-Rod's upcoming press conference, according to MLB.com's John Schlegel. "We'll be there," Posada told the Post. "Obviously, we have to ask Alex if it is OK, but if he says yes, we will go with him. I think it will be the guys who have been here the longest and anyone else that Alex might want." Peter Abraham reports that the Yankees have signed pitcher Brett Tomko to a minor league deal. Tomko, who will be 36 this season, went 2-7 with an E.R.A. of 6.30 in 22 games with the Royals and Padres last year. The troubled ex-Yankee - accused of killing a Florida mom in a drunken 2007 car crash - was jailed Friday after prosecutors said he repeatedly got behind the wheel after drinking. Leyritz was charged with manslaughter in a Dec. 28, 2007, crash that killed Fredia Ann Veitch. She also was drunk when her car collided with his SUV. Leyritz claims he felt he was no longer subject to the conditions of the bail and was therefore free to drink. This guy needs to get some help before it is too late, if it's not already. McNamee's attorneys said Clemens' lawsuit should be thrown out because McNamee was compelled to cooperate by federal investigators. U.S. District Judge Keith Ellison agreed, but he left in McNamee's statements to Andy Pettitte, Clemens' former New York Yankees teammate. McNamee told Pettitte that Clemens had used HGH and steroids. This whole A-Rod scandal probably would have made this a good time for Roger to fly under the radar and just drop this silly lawsuit altogether. Our next interview is with long time friend of the blog, Aziz Nekoukar of Pride of the Yankees. My brother and I took over Pride of the Yankees at NJ.com at a very inopportune time in Yankee history: October, 2004. We wrote an infamously overconfident entry after the Yanks took a 3-0 series lead. (That entry has thankfully disappeared since NJ.com changed its blog format). The daily grind is really tough; sometimes I just don't want to read the daily non-baseball stories that constantly surround the Yankees. Because, do I really care where Brian Cashman ate his dinner last night? But the best part is interacting with people that really care about the team. For whatever lucky reason, we've developed this devoted readership which is full of rational-thinking Yankee fans - and you don't hear the phrase "rational-thinking Yankee fans" in many places. Peter Abraham and Tyler Kepner report that Joe Girardi hopes for Jorge Posada to catch 100-110 games this season. So, Jose Molina should see a good amount of time this year. Peter Abraham has the list of this year's guest instructors at spring training. They are Yogi Berra, Billy Connors, Goose Gossage, Ron Guidry, Reggie Jackson, Hector Lopez, Tino Martinez, Stump Merrill, Graig Nettles and Mickey Rivers. Peter Abraham has Bud Selig's statement on A-Rod's admission of steroid use. “On behalf of Major League Baseball, I am saddened by the revelations concerning Alex Rodriguez’s use of performance-enhancing substances. While Alex deserves credit for publicly confronting the issue, there is no valid excuse for using such substances and those who use them have shamed the game. Both Abraham and Kat O'Brien say that this means that A-Rod won't be getting suspended. Yesterday, Selig was said to be considering some sort of action against the Yankees third baseman. B.A.T. announced the creation of The Bobby Murcer Award, which will be presented to the team in both the American League and National League whose players contribute the most amount of money to B.A.T. through the Major League Baseball Payroll Deduction Program. The award will be presented during the 2010 Annual B.A.T. Dinner. "Once you start tinkering, you can create more problems," Selig told USA Today, referring to the record books. "But I'm not dismissing it. I'm concerned. I'd like to get some more evidence." Bryan Hoch of MLB.com has Mark Teixeira's reaction to A-Rod's admission of steroid use. Lyle Spencer, also of MLB.com has thoughts from Torii Hunter. "I've been around long enough to not really be shocked by anything," he said. "This is a sport that's had some troubles, there's no doubt. I'm not going to judge anybody. "I've never touched steroids or any of those kinds of things -- it's something I feel very strongly about -- but at the same time I've made mistakes, I'm not perfect, no one's perfect." "I hate it, the whole steroid thing, and I know it's wrong," Hunter said by phone. "But it takes courage to come out and say, 'I did it,' like A-Rod did. "He nipped everything in the bud when he came out and told the truth. I know he was sincere. I know him, and I like him. He is the type of guy who couldn't have this hanging over his head. He's taking all the heat now, and that's not easy for anyone, but he's a strong guy. "To me, it's like when you're a parent, and your kid does something stupid, like all our kids do. You punish them, let them know what they did wrong and why, then it's back on track. I hope that's how it will be for A-Rod." MLB.com's Bryan Hoch reports that right handed pitchers J.B. Cox, George Kontos and Kanekoa Texeira have been invited to camp. Wayne Parry of the AP reports on the sentencing of Ryan Ward, who impersonated Joba Chamberlain and received free food and drinks at restaurants. He signed autographs and was approached by women. "There were many," he says. He received a fine of $2,518 and two years on probation. The article has pictures of him and he does bare a resemblance. Though, frankly, I don't know how many actual Yankee fans would have been fooled by him. The Post has quotes from Joe Girardi and the Times spoke with Brian Cashman, both on the subject of Alex Rodriguez's admission to performance enhancing drug use. "I was not expecting that," Girardi said. "I think all of us always thought of Alex not taking anything, and I was a little bit shocked, but I was happy with the way he's approached this, dealt with it so far. "I would probably be worried if he had never been through a controversy before," Girardi said. "If he had never been booed in stadiums, if he was the one that everyone always pulled for, but Alex, everywhere he goes, there's resentment or people that don't like him for whatever reason. “This will be a long process,” Cashman said. “It was a long way for Jason Giambi. I don’t know if it ever really went away. Maybe it wasn’t as loud. It was very loud and then it got softer, but there were always rumblings about it. There always will be. The new chairman of the congressional committee said Tuesday he does not think lawmakers need to hear from Rodriguez in the wake of the superstar admitting he used performance-enhancing drugs from 2001-03. “The American people need leaders who will focus on stemming job losses and getting credit to flow in the marketplace before hearing from yet another person who cheated both himself and the game of baseball,” said House Committee on Oversight and Government Reform chairman Edolphus Towns, a Democrat from New York. Towns did say he plans to monitor baseball’s drug policy and did not rule out the possibility of hearings down the road. If reading is more your thing, ESPN has a transcript available. "We strongly believe there is no place in baseball for performance enhancing drugs of any type, and we support the efforts of the Commissioner to continually improve the testing process. We urged Alex to be completely open, honest and forthcoming in addressing his use of performance enhancing drugs. We take him at his word that he was. Although we are disappointed in the mistake he spoke to today, we realize that Alex—like all of us—is a human being not immune to fault. We speak often about the members of this organization being part of a family, and that is never more true than in times of adversity. Alex took a big step by admitting his mistake, and while there is no condoning the use of performance enhancing drugs, we respect his decision to take accountability for his actions. We support Alex, and we will do everything we can to help him deal with this challenge and prepare for the upcoming season." Major League Baseball Players Association Executive Director, Donald M. Fehr, today issued the following statement in response to questions raised concerning recent reports about the 2003 testing program. "We are issuing this statement today to respond to two questions that have been raised in the last few days in connection with reports about Alex Rodriguez and the 2003 MLB testing program. First, it has been asked why the results from our 2003 survey tests were not destroyed before they were seized by the government in the spring of 2004. The short answer is that in November, 2003, before that could take place, a grand jury subpoena for program records was issued. In mid-November 2003, the 2003 survey test results were tabulated and finalized. The MLBPA first received results on Tuesday, November 11. Those results were finalized on Thursday, November 13, and the players were advised by a memo dated Friday, November 14. Promptly thereafter, the first steps were taken to begin the process of destruction of the testing materials and records, as contemplated by the Basic Agreement. On November 19, however, we learned that the government had issued a subpoena. Upon learning this, we concluded, of course, that it would be improper to proceed with the destruction of the materials. The fact that such a subpoena issued in November 2003 has been part of the public record for more than two years. See, U.S. v. CDT, 473 F3d at 920 (2006), and 513 F3d at 1090 (2008) (both opinions have now been vacated). Other subpoenas followed, including one for all test results. Over the next several months we attempted to negotiate a resolution of the matter with the United States Attorneys Office for the Northern District of California. During that time we pledged to the government attorneys that the materials would not be destroyed. When the government attorneys refused to withdraw its subpoena for all 2003 test results, we decided to ask a judge to determine to what the government was entitled. See, 473 F3d at 944, and 513 F3d at 1118. On the same day we were filing our papers with the court, the government attorneys obtained a search warrant and they began seizing materials the following day. Pursuant to that search warrant which named only 10 individuals, the government seized records for every baseball player tested under our program, in addition to many records related to testing in other sports, and even records for other (non-sport) business entities. Later in 2004 three federal district judges in three different judicial districts ruled that the government’s seizures were unconstitutional under the Fourth Amendment and ordered the government to return all the materials seized (except for those related to the 10 players listed in the original search warrant). The government appealed and the matter is still pending before the United States Court of Appeals for the Ninth Circuit. On December 18, 2008, the case was reargued before an en banc panel of Ninth Circuit judges. The second question that has been raised in recent days is whether Gene Orza or any other MLBPA official was engaged in improper “tipping” of players about 2004 tests. As we have said before, there was no improper tipping of players. Any allegations that Gene Orza or any other MLBPA official acted improperly are wrong." Finally, Selena Roberts has responded to the accusations that A-Rod made about her methods - namely that she tried to break into her house and was cited by police. Peter Abraham adds that "police spokesmen in New York, Miami, Miami Beach and Coral Gables have no record of Selena Roberts being arrested, stopped or cited." Brian Cashman told Peter Abraham that Joba Chamberlain will be the Yankees fifth starter. This will help the Yankees to keep tabs on his innings pitched, as they will be able to skip his start sometimes. I have decided to go ahead and liveblog Peter Gammon's interview with Alex Rodriguez, that will be starting within the hour. When it starts, I'll start writing. For more on the SI.com story, see our earlier post. 2:14 PM: They just broke in to say that A-Rod has admitted to using performance enhancing drugs. They are now saying we'll get a "portion" of their exclusive interview. 2:18 PM: T.J. Quinn says that he apologized for using it and he only used it during a period from 2001-2003 [corrected at 2:22 PM]. He felt a ton of pressure, after receiving his contract from Texas. He called it a "loose culture," that he was stupid and naive. 2:20 PM: Wow, nice slip of the tongue by Quinn. "caught cheating, [cough] excuse me, tested positive." 2:21 PM: Quinn says that A-Rod says that Gene Orza called him in 2004 and said there is a list of positives and said that you, A-Rod, may or may not be on the list. 2:22 PM: To correct what I had above, he said that he used them from a period of 2001-2003. Not just 2003. From this point on, Alex said, it has been him and his talent. The interview is still going on, but we haven't seen it, yet. "When I arrived in Texas in 2001, I felt an enormous amount of pressure. I felt like I had all the weight of the world on top of me and I needed to perform and perform at a high level everyday. Back then, it was a different culture. It was very loose. I was young. I was stupid. I was naive. And I wanted to prove to everyone that I was worth, you know, and being one of the greatest players of all-time." "I did take a banned substance and for that, I am sorry, and deeply regretful. And, although, it was a culture back then and in Major League Baseball overall was very... [pause] I just feel that, you know, I'm just sorry. I'm sorry for that time. I'm sorry to my fans. I'm sorry for my fans in Texas. It wasn't until then that I ever thought about substance of any kind. And, since then, I've proved to myself and to everyone that I don't need any of that. "Peter, that's the thing. Again, it was such a loosey goosey era. I'm guilty for a lot of things. I'm guilty for being negligent, naive, not asking all the right questions. And, to be quite honest, I don't know exactly what substance I was guilty of using." That's all they gave us. They now say that you can watch the whole interview tonight at 6 PM. ESPN, you tease. That's all, for now. ESPN just broke in, as we wait for the interview with A-Rod, to say that A-Rod has admitted to using performance enhancing drugs. More later. I just saw this report by Bob Raissman of the Daily News, saying that A-Rod is expected to speak on ESPN today. I saw it through Ben via AD. I flipped on ESPN and they are saying he'll be on within the hour. It's 2:01 PM ET right now. Yankees teammate Derek Jeter, speaking from the club's spring training site in Tampa, Fla., on Monday, said Rodriguez should be given "the benefit of the doubt." "My intitial reaction is let him respond" to the report, Jeter said, according to Newsday. "Give him the respect to respond to it before you pass judgment." See the accompanying article for more. Andrew shares an interesting passage from "The Yankee Years." It talks about how George Steinbrenner helped clean up the Yankees clubhouse when a pipe broke during game 4 of the 2000 World Series. I’ve seen a lot of different reactions in the 36 or so hours since I’ve heard the news of A-Rod’s positive steroids test in 2003. Some of his fans and Yankee fans are crushed by the news that their hero had been cheating. Some have commented that this news just reinforces the gut feeling they had all along, which is that everybody was doing this stuff. After all, if you can’t trust the guy who was supposed to be baseball’s savior and rescue the all-time home run record from Barry Bonds, then who can you trust? I even saw some guy on T.V. liken what A-Rod did to Elvis lip-synching. And then there are others who have somehow shrugged this whole thing off completely and are just waiting for baseball to be played in 2009. But how much has the issue of steroids really tainted baseball history? Of course we all know about the Black Sox Scandal of 1919 in which eight Chicago White Sox players were banned from baseball for having intentionally thrown away the World Series for a monetary gain. However, despite the un-impeccable proof that the Sox threw away the Series, the Cincinnati Reds still remain in the record books as baseball’s World Champions in 1919. After all, guys like Babe Ruth and Lou Gehrig achieved their numbers in an all-white era of baseball history. How can these guys’ numbers be any more legitimate than Barry Bonds' or A-Rod’s when a good portion of the game’s best players were being denied entry in to Major League Baseball? If guys like Satchel Paige were allowed into the bigs, would Babe Ruth have even hit 714 home runs? Would Josh Gibson have hit more? Would Ted Williams have hit over .400 in 1941? Do we know that during the course of Joe DiMaggio’s famed 56-game hitting streak that he wouldn’t have faced just one pitcher somewhere down the road that he just couldn’t solve? Imagine if guys like Derek Jeter, Ken Griffey Jr., Ryan Howard, Hanley Ramirez, CC Sabathia, Johan Santana and David Ortiz were taken away from today’s game simply because of the color of their skin. Would David Wright’s or Chase Utley’s or Mark Teixeira’s numbers be legit? If you would answer no to that question, you’d have to treat Ruth, Gehrig, DiMaggio, Ty Cobb, Rogers Hornsby and Ted Williams the same way. So in terms of “clean” baseball history, that would just leave the 50’s through the early 80’s, years in which players of all sizes, shapes and colors were allowed into the game and before steroids were assumed to be prevalent in MLB. Yet baseball added eight games to the schedule (the AL in 1961, the NL in ’62). That is not something that today we see as very significant, but it was a major cause of contention at the time. Roger Maris broke Babe Ruth’s single-season home run record in the first year of the 162-game schedule. Baseball Commissioner Ford Frick was even reluctant to acknowledge the record at the time, saying it should be noted in the record books that Ruth hit his 60 home runs under a 154-game schedule. It also shouldn’t be forgotten that Gaylord Perry, a dominant pitcher of the era and Hall of Famer, admitted to throwing spitballs his entire career. Heck, how do we know that no players during that era used steroids? Many players from the 1970’s Pittsburgh Steelers teams that won four Super Bowls have admitted to steroid use. Former Steeler Jim Haslett admitted to such use and claimed that steroid use was very rampant at the time. If steroid use was common in football back in 1975, why wouldn’t these drugs be readily available to baseball players? Are we so naive to just assume that Jose Canseco was the first guy in baseball ever to use performance-enhancing drugs? Likewise, we don’t know for sure that the 1919 White Sox were the only team ever to throw a World Series. We just know they are the only team to get caught. So what records in baseball really are legitimate, anyway? How do we know for sure? A lot of us like to look back on the days before television and corporate stadium names as baseball's "golden era," but was it really? Personally, I would much prefer to stand by numbers achieved by a bunch of steroid users who played with other steroid users over numbers achieved when a massive portion of the best players were excluded from the game. Then again, maybe it’s all just arrogance and denial on my part. "The union had the legal right to destroy that list after a certain amount of time, however, and it didn't," Ken Davidoff said, yesterday. "Which is why A-Rod is now forever scarred." I think that A-Rod is forever scarred because he took steroids, not because the list leaked - but, the point is made. Shouldn't someone be fired over this? Maybe someone already was. The MLBPA is for the players and seemingly protects their interests alone. We heard this offseason about how they might pressure CC Sabathia if he took a dramatically cheaper deal from the Brewers, as opposed to a big money deal to the Yankees. Those types of stories aren't unique. I would think "destroy the list of positive steroid test results" should rank somewhat high on the old to do list, no? Sam Borden mentioned that the reporter on the SI.com story went to Miami to talk to A-Rod on Thursday. Borden says that this means that A-Rod knew of the report two days before it came out and, yet, seemingly did not tell the Yankees. Finally, we may as well get this out of the way. Here is the clip from A-Rod's interview with Katie Couric, where he unequivocally denied using steroids, human growth hormone or other performance enhancing drugs. “We are disturbed by the allegations contained in the Sports Illustrated news story which was posted online this morning. Because the survey testing that took place in 2003 was intended to be non-disciplinary and anonymous, we can not make any comment on the accuracy of this report as it pertains to the player named. “Based on the results of the 2003 tests, Major League Baseball was able to institute a mandatory random-testing program with penalties in 2004. Major League Baseball and the Players Association have improved the drug testing program on several occasions so that it is now the toughest program in professional sports. The program bans stimulants, such as amphetamines, as well as steroids. “Any allegation of tipping that took place under prior iterations of the program is of grave concern to Major League Baseball, as such behavior would constitute a serious breach of our agreement. “Information and documents relating to the results of the 2003 MLB testing program are both confidential and under seal by court orders. We are prohibited from confirming or denying any allegation about the test results of any particular player(s) by the collective bargaining agreement and by court orders. Anyone with knowledge of such documents who discloses their contents may be in violation of those court orders. Oh man. Here we go. Sports Illustrated is reporting that, according to four sources, Alex Rodriguez tested positive for two anabolic steroids in 2003. SI.com reported that two sources familiar with the evidence that the government has gathered in its investigation of steroid use in baseball and two other sources with knowledge of the testing results said that Rodriguez is one of the 104 players identified as having tested positive, in his case for testosterone and an anabolic steroid known by the brand name Primobolan. The SI.com report also indicated, citing three Major League players, that Rodriguez was tipped by MLBPA Chief Operating Officer Gene Orza in early Sept. 2004 that he would be tested later that month. Rodriguez declined to respond to SI when asked about the warning Orza provided him. 02/06: Mussina Comments on Rivera Remarks in "The Yankee Years"
Following up on an earlier report, MLB.com's Bryan Hoch shares more from the Mike Mussina interview on WFAN on Wednesday. "The idea of it was not to take any stabs at Mo," Mussina said on WFAN in New York. "I can't put into words how important Mo has been to me as an individual player and to us as a team since I went to New York. My accomplishments would not be anywhere near what they are and our team accomplishments certainly would not be what they are without him pitching the ninth inning. "I didn't mean to take any stabs at him. I was just making a factual comment, and it came out sounding like I was trying to cut him down. I'm certainly not trying to cut him down, because he certainly is legendary, and he's earned that." Mussina also has more about Jeter and A-Rod (basically saying that he never saw a problem) and Carl Pavano. See the original post about the comments, for more. 02/06: Jason Giambi on "The Yankee Years"
Jason Giambi as commented on "The Yankee Years," speaking to Lisa Guerrero of the Los Angeles Times. "It's definitely hurtful," he told me. "When you play together that long, you're family. There's a certain trust involved. We were always like 'keep everything in-house, especially in New York with that media.' I was surprised to hear that he was writing a book ... he meant so much to that town. But from his point of view you can respect it. He had to get things off his chest," referring to Torre's bitter exit from the Yankees. When I asked if writing the book violated the trust of his former team, Giambi said, "That's hard to answer. We were all going in the same direction, we were a family. I can see how other guys will be hurt by it." Then Giambi offers, "It's hard to know what came from Verducci and what came from Torre," referring to Tom Verducci, who co-authored the book. "That guy was always hanging around." Texas, Philly, Atlanta and both New York teams are among teams thought to have some interest in Andruw Jones, who went from superstar to clueless hitter in two short years. The Yankees offered a non-roster spot and were turned down. Texas looks like a better fit. Jones probably needs a top hitting coach to get his swing back to where it was in 2006. Kevin Long would have worked in New York, and so would Rudy Jaramillo in Texas. The AP reports that on March 3, the U.S. team for the World Baseball Classic, of which Derek Jeter is a part, will play a warm up game against the Yankees. Jeter playing against the Yankees. I'm sure time will continue onward. SI.com's Jimmy Tarina has a pretty lighthearted interview with the captain. It's a fun read and what you'd expect. Jeter also spoke with the AP about "The Yankee Years" and A-Rod. "Knowing Mr. Torre, he's never going to intentionally try to hurt somebody," Jeter said. "He's like a second father to me. Everyone knows how close we are. He's not going to intentionally go out and do harm to somebody. That's not the kind of person he is." Via Sam Borden and Andrew. USA TODAY Sports Weekly presents its 13th annual list of the 100 Names You Need to Know. These are the next wave of players heading into the major leagues who, in our view, could make the biggest impact during the 2009 season. These aren't necessarily baseball's 100 best prospects, because many top prospects are too far down in the minor leagues to contribute in the majors this season. Others are stuck behind established major leaguers. Not all of the players on our list have rookie status, but our standard for inclusion is that a player must have had more innings or at-bats in the minor leagues in 2008 than he has had during all of his major league time. 35. Brett Gardner, OF, Yankees: Right now, Gardner is stuck in a five-man logjam in the Yankees outfield. Things could clear up for him (a trade of Xavier Nady or Nick Swisher, further club dissatisfaction with Melky Cabrera) or get more crowded (Jorge Posada forced to DH, pushing Hideki Matsui into the outfield mix). Gardner, 25, gives the Yankees a needed burst of speed (he stole 13 bases in 14 tries) and does the little things well, but will need to hit more — maybe a lot more — to get playing time. 84. Austin Jackson, OF, Yankees: The weak link in the Yankees' lineup, at least offensively, is center field, where either Brett Gardner or Melky Cabrera is likely to be on opening day. By some point later in the season, it's not an unrealistic scenario that Jackson, 22, could be there. He is speedy with the ability to hit for average like Gardner but has more power. Cabrera can do similar things as Jackson offensively but slumped terribly at the plate last year. If Cabrera slumps again, Jackson will be a call away in Class AAA. 97. David Robertson, RHP, Yankees: Robertson, 23, emerged as a steady big-league bullpen option, then hit the wall with an 8.18 August ERA and was sent back to Class AAA. He throws hard enough to be a factor again this season, if not immediately. 02/04: Moose: I Didn't Know I'd Be Quoted in "The Yankee Years"
Neil Best reports that Mike Mussina told WFAN's Mike Francesa that he didn't know about the book or that his quotes (like the one about Mariano Rivera) would be included in it. When asked if he likes that, or not, he said: "Well, I don't have much choice, but I'm not upset about it. I've always liked Tom and I loved playing for Joe. I don't really have any problems with it, I guess." The Yankees have traded minor league pitcher Chase Wright to the Milwaukee Brewers for 23-year old outfield prospect Eric Fryer, according to the team's official site. Wright spent most of his Yankees tenure in the minors, although he did pitch in three games for the Bombers in 2007. He went 2-0 with a 7.20 E.R.A. in his three appearances, but is probably most widely known for allowing four straight homers to the Red Sox at Fenway Park in April of '07. I won't pretend to be familiar with Fryer's game, but he put up solid numbers in his first professional season, posting a .914 OPS in A-ball last season. The Brewers have also signed former Yankee Ramiro Mendoza to a Minor League deal. I thought I'd highlight a number of interesting "The Yankee Years" related articles. Yankees catcher Jorge Posada has come out in defense of Joe Torre, in an interview with The Daily News. After his workout, Posada said he might visit a Tampa bookstore to buy Torre's book, which was released yesterday. Posada hasn't read the book, but plans to, and said he was basing his initial opinions of it on media reports. He tried to call Torre recently, he said, more to say hello than anything else, and left a message. "It really isn't explosive," Posada said of the book. "We'll have to sit down and read it, but what's been said in the media, nothing's been surprising to me. I think he's just talking about his experiences with the winning teams and all that. He hasn't really said anything we didn't know. "Joe's done nothing wrong, in my eyes. He's been a father figure to me, so I don't think he can do any wrong." Johnny Damon, Bernie Williams and Carlos Beltran - all mentioned in "Years" - attended the Thurman Munson awards dinner on Tuesday. All 3 of them were asked to comment. To his credit, Rivera – during an interview on MSG Network at halftime of Monday’s Knicks game – brushed off the criticism. He also said he was planning to buy Torre’s book and didn’t really comment one way or another on Torre writing it. SportingNews reports that free agent second baseman Orlando Hudson told MLB Network that the Yankees are among the four teams interested in his services. He named the Mets, Nationals and Dodgers as the others. Perhaps more interestingly, Hudson said that he hadn't been told that he would need to move to another position. That said, and in light of Cashman's comments about the Manny race, I don't think that Robinson Cano has a whole lot to worry about. The Associated Press checked in on the rehab status of Chien-Ming Wang and Jorge Posada. Wang, who threw 27 times in his first mound session of 2009, has the blessing of pitching coach Dave Eiland. "He’s full go for spring training," Eiland said. Posada doesn't plan to catch in any spring training games until "around March 8," but he does expect to be in the lineup, come opening day. 02/04: Cashman: No Manny, Yankees in "Non-Roster-Invite Mode"
MLB.com's Bryan Hoch has the following quotes from Brian Cashman, who appeared at a charity fundraiser on Tuesday. "Ultimately, we've made our decision," Cashman said. "We chose to put that money into Mark Teixeira to play first base. I do hear rumblings [that] people actually expect us to get in on Manny. That's not going to happen. "We respect his abilities, there's no doubt about it, but we're now in the non-roster-invite mode. ... We've secured the areas of need and hopefully put ourselves in a better position. We're not playing on any Major League free agents, other than non-roster invites." 02/03: Jeter: "Alex is a Teammate. I Support Him." SI.com has this quote from Derek Jeter, speaking in reference to his relationship with A-Rod. "I'm just curious as to why people keep asking the same questions over and over. We've been down this road before. Alex is a teammate. I support him. Our whole team is behind him. We all support him. And we're looking forward to a new season. To be quite honest with you, it's old hearing the same questions. It's something that's been addressed before in the past. Everyone's moved beyond it. And it doesn't really need to be addressed again." Honestly, I think this whole subject is generally overblown in so many ways and contorted in so many ways. Amid the initial uproar over "The Yankee Years," Torre revealed to the New York Times that he told Cashman, "we'd always be friends." As much as Torre talks about trust, he cannot possibly believe that. Cashman, friends say, is "crushed" by how Torre depicted him in the book. He had considered Torre a second father. And he was loyal to Torre, except, perhaps, at the very end. Torre should be upset if Cashman indeed failed to speak on his behalf at the final meeting — and if Cashman failed to inform ownership of a contract proposal that Torre believed might save his job. But is that even what happened? Some close to Cashman dispute that the final meeting went down as Torre described and say that other portrayals in the book are pure fiction as well. "The Yankee Years" was released today. 02/02: Mussina Said... What? About Mariano Rivera? Torre said he stands behind everything in the book, even though it is written by Verducci in the third person. That means, he fully approved Mike Mussina's insensitive critique of Mariano Rivera on Page 312: "As great as he is, and it's amazing what he does, if you start the evaluation again since I've been here, he has accomplished nothing in comparison to what he accomplished the four years before. He blew the World Series in '01. He lost the Boston series. He didn't lose it himself, but we had a chance to win in the ninth and sweep them and he doesn't do it there. . . . That's what I remember about the '04 series." This is not what I'd expect from Mike Mussina, a guy who usually pretty well considers what he says, in my opinion. Sure, he may not have the postseason stats he had before Moose came to town, but really, for much of that time, he was considered by many (most?) to be the best closer in the game. I think this is a little unfair, to say the least. Nick Cafardo of the Boston Globe reports that Melky Cabrera is out of options. Meaning that, if he is taken off of the 40 man roster (to make room for someone else, for example), the Yankees will have to either trade him or place him on waivers, giving other teams a crack at him, before being able to send him down to the minors. Update: Edited for clarity, as reflected in the comments. Thanks Mike. The M's and Yankees briefly explored a Washburn-for-Hideki Matsui exchange earlier in the offseason, but the discussions never progressed because Matsui at $13 million is even more expensive than Washburn at $10.35 million this season. The Yankees are not currently pursuing free-agent reliever Juan Cruz, according to a major-league source. It's conceivable the Yankees' position could change if they trade Nick Swisher or Xavier Nady, but club officials are comfortable with Brian Bruney and Damaso Marte in the eighth inning and Edwar Ramirez, Jose Veras and Co. before that. The team also is deep in major-league-ready relievers — David Robertson, Mark Melancon, Phil Coke, etc.